Earlier this year I discussed the value created by writing by hand. By writing on whiteboards or scribbling in a notebook, ownership, learning, and understanding is created. Similarly, truly understanding numbers creates ownership, learning, and understanding – thereby creating the potential for action. I’m not talking about statistics or the interpretation of statistics. We all know that different perspectives can be “created” from otherwise accurate data to tell any story. Just ask anyone in Washington – from any side. I am talking about numbers that don’t accurately reflect underlying conditions, or numbers that don’t relate to the reality of the process owners. 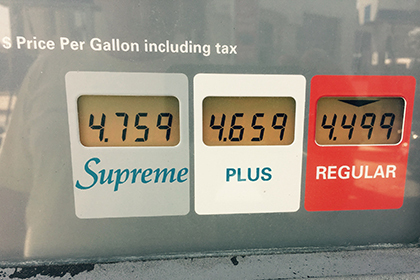 As one example, here’s a photo from my local gas pump here on the central coast of California, just today. As my brother in-law remarked while visiting from Michigan last week, “that’s not per gallon, right?” Yep, per gallon, typical for all gas stations around here, and yes far more than most other parts of the country are paying. Most Californians are used to it, most U.S. visitors from outside of California just look wide-eyed, and most visitors from Europe still go “wow, that’s cheap.” But how many understand that while everyone pays 18.4 cents in federal gas taxes, each state is radically different in terms of state gas taxes… taking California’s gas tax to over 60 cents a gallon, among the highest in the country? How many understand that California requires a special gas formulation in the summer, produced only at in-state refineries, reducing scale and increasing risk from at-capacity refinery downtime, contributing to nearly an extra dollar per gallon in cost? My point isn’t whether this price is too high or not – perhaps our air is cleaner due to special gas and perhaps our roads are better due to higher taxes (my brother in-law actually thought so) – but having the basic information in order to analyze that value relationship. In order to create simplicity, a laudable goal, critical information and knowledge is lost. Another example: home water use is typically measured in “units.” Here’s one article from last Sunday’s paper on water usage here in California, obviously a popular subject. What the heck is “25 units of water?” To make matters worse, a “unit” is different in different parts of the world. Here in the U.S. it’s typically 100 cubic feet, or 748.5 gallons. Elsewhere it’s a cubic meter, or 220 gallons. But who relates to a “unit?” Here in California, where we’re being asked to reduce water usage by 25%, how do we relate to the numbers we see on our monthly bill? I’m being asked to reduce water use from 10 to 7.5 “units.” Whatever. But ask me to reduce by 1871 gallons a month and I start to think about shorter showers, low flow toilets, changing from grass to a more natural drought-tolerant landscaping, and so forth. Especially if my cost for those 2.5 units is about to skyrocket. I understand it, I own it, and I can learn how to improve. One final example: individual income taxes. Romney stepped into it a bit during the last election cycle by stating that 47% of taxpayers pay no federal taxes. A little misleading as all except for 14% (primarily the elderly) do generally pay federal payroll taxes for Social Security and so forth – just no direct federal income taxes. Still, the point that nearly half of taxpayers don’t contribute to a general expenditure bucket they have voting control over and receive benefits from is an interesting point outside the scope of this post. But how many of those 47%, and even the rest, really understand how much taxes are being paid and especially how they are being used? For the vast majority of people taxes are simply lines on their pay stub, generally ignored, and an annual reconciliation effort where they are often excited that they gave a loan to the government and now get it back, without interest. Probably even more so now that paper pay stubs are becoming a rarity, and people have to take action to log into a system to review an online pay stub. How many really do that? How many can tell you how much they pay every two weeks in federal, state, Social Security, disability, and other taxes? The net amount becomes the reference value. Just like the gross amount is the reference value for gas prices. Those of us who are self-employed or own companies are a little different since we have to actually cut a physical check to the Feds (and state) each quarter. Ouch! Now it becomes reality, and you start to be very interested in how much it is and how it is used. Although it would be a bureaucratic and compliance nightmare, perhaps everyone should have to physically write a check, withdrawing real money from your account, instead of simply accepting the net deposit? If you have to give up the equivalent of a vacation, a dinner, or even a beer to make that payment, it becomes real. Ownership, understanding, and learning is created. So be careful with simplifying numbers. While simplification is a great goal, too much simplification may remove knowledge and create dangerous ignorance.